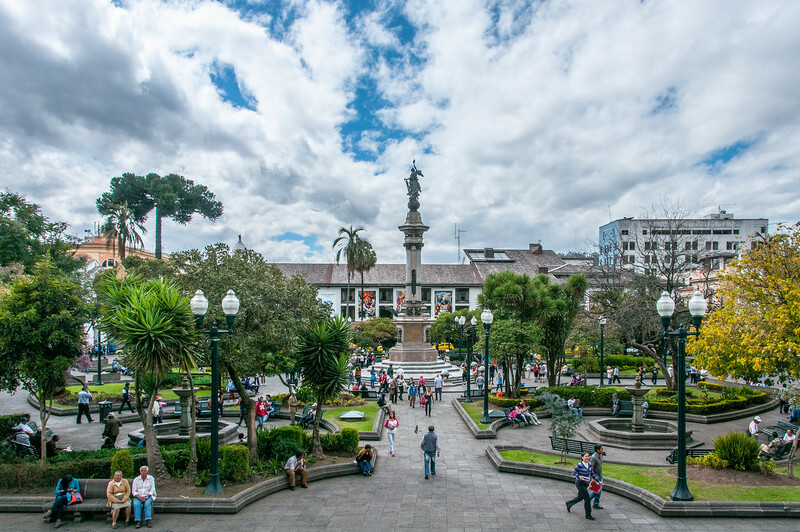 Quito, the capital of Ecuador, was founded in the 16th century on the ruins of an Inca city and stands at an altitude of 2,850 m. Despite the 1917 earthquake, the city has the best-preserved, least altered historic center in Latin America. 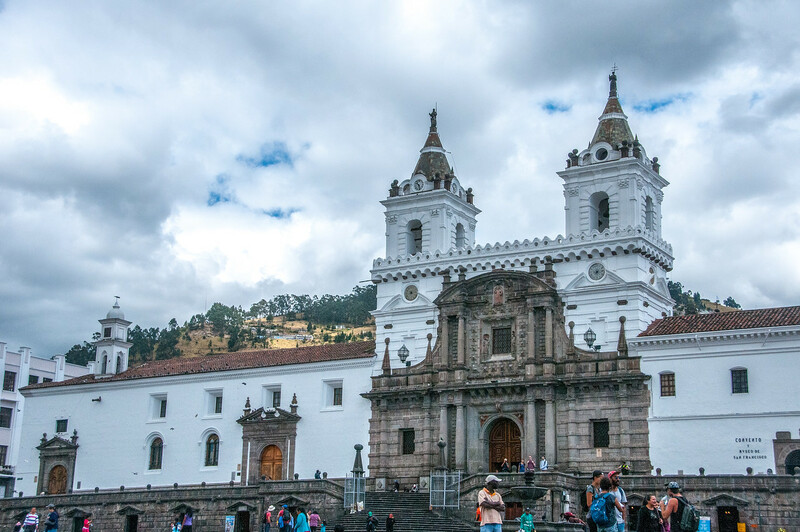 The monasteries of San Francisco and Santo Domingo, and the Church and Jesuit College of La Compañía, with their rich interiors, are pure examples of the ‘Baroque school of Quito’, which is a fusion of Spanish, Italian, Moorish, Flemish and indigenous art. Quito was the first cultural World Heritage site and the second overall after the Galapagos Islands. Quito is considered to be one of the best preserved Spanish colonial cities in Latin American and the best capital city. The highlight of the old city to me was the cathedral. If you should find yourself at the Quito Cathedral, check out the gargoyles on the outside. They are all animals you will find in Ecuador and the Galapagos Islands, including marine iguanas and tortoises. The City of Quito is the capital city of Ecuador. 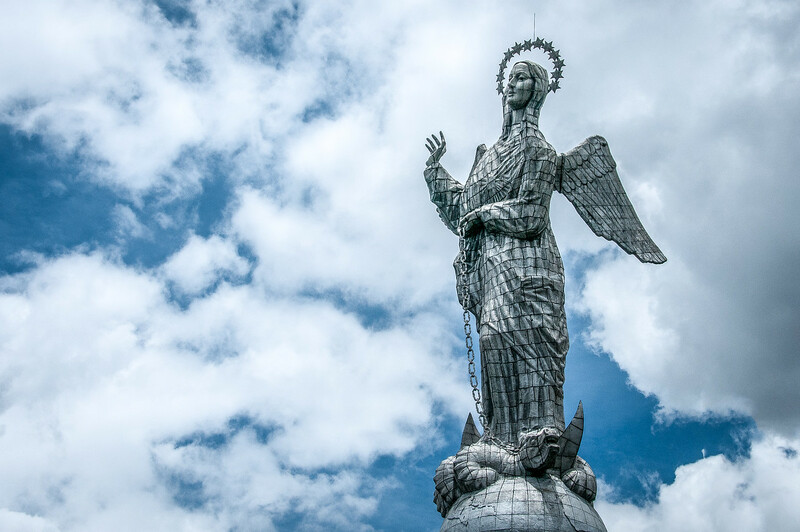 It is officially known as San Francisco de Quito, which is known as the second highest official capital city (next to La Paz in Bolivia) with an elevation of 2,850 meters above sea level. Aside from being known as Ecuador’s capital, this is also a cultural UNESCO World Heritage Site. This city was inscribed into the UNESCO list in 1978. The entire protected area spans 320 hectares in land area. The city of Quito in Ecuador was founded in the 16th century. The current location of the city was also the former site of the ruins of the ancient Inca City. The excavations done by archaeologist Robert E. Bell in 1960 have enabled him to gather evidence to distinguish the oldest traces of human settlement in the city. This evidence was gathered from the slopes of Ilalo volcano. There are hunting and gathering tools that were discovered on the site, which were dated to be from 8,000 years BC. Among the items that were uncovered at the site included projectile points, basal fluting, and other surface materials. Another site that proved of importance to tracing the history of the City of Quito is in the neighborhood of Cotocollao. The history of this neighborhood dates back to 1,500 BC. This prehistoric village is where archaeologists discovered burials, pottery and stone offerings. By the 18th century, Quito and most of Ecuador came under the rule of the Spanish Empire. Like other colonies of Spain, the Roman Catholicism was established in the city. In fact, the first church in Ecuador was established in Quito even before the city was officially founded. By 1743, after nearly 3 centuries of Spanish colonization, there were already around 10,000 inhabitants in Quito. The city and the entire country gained independence from Spain in 1809. However, the several centuries of Spanish rule have allowed the Spanish influences to be deeply embedded into the culture and way of life in Quito. To this day, those influences are still evident and is a huge part of the locals’ daily life. 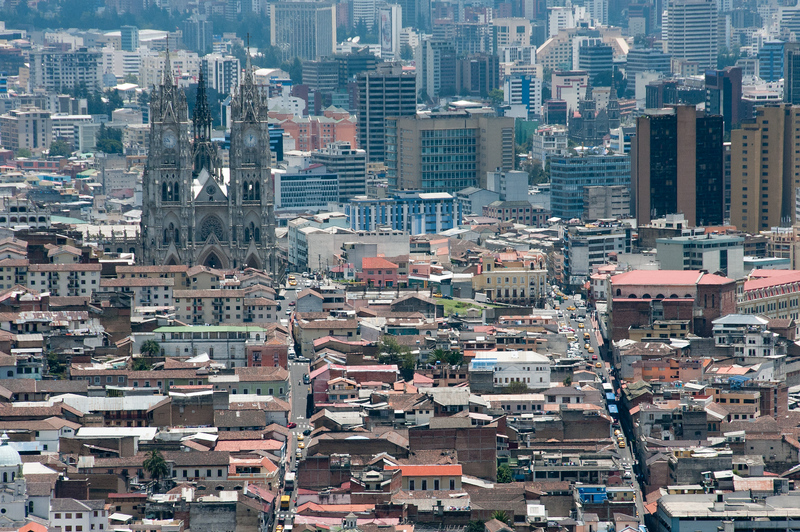 As of 2014, the city of Quito is the most populous city in Ecuador with 2.6 million inhabitants. The second most populous city is Guayaquil. The City of Quito earns the distinction as being the first city in the world to be declared a UNESCO World Heritage Site. On the same year, Krakow in Poland was also named a UNESCO World Heritage Site. The City of Quito was recognized by UNESCO as World Heritage Site as it meets 6 out of 10 criteria that would make a city a cultural capital. First and foremost, the city exhibits the interchange of human values dating back to the time of the Spanish colonial period. The Spaniards have impacted the town planning, architectural design, and cultural traditions of Quito. At the same time, there are also several traces of its Inca history and heritage, as evidenced by the archaeological finds in many parts of the city. Archaeologists even claim that there could be more sights that bear these evidences that have yet to be discovered. The historic center of the City of Quito has also retained many of the old structures that date back to the colonial period. From the colonial center, town layout, magnificent churches, and cobblestone streets, all of these have remained intact until today.